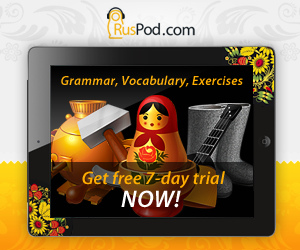 The following vocabulary lessons will help you to learn basic to intermediate Russian vocabulary. Click on the underlined word or phrase to hear it pronounced by a native Russian speaker. Some lessons have a gray play button to the left of a word or phrase. Click on this button to listen to the pronunciation. Here are all the phrases you will need to say hello in Russian, whether you greet formally or informally, early in the morning or late in the evening. Learn how to introduce yourself and other people using essential basic phrases as "My name is..." or "I am from..."
Learn the words and phrases to say when parting. Learn how to order meals, drinks, reserve a table, ask for a bill, etc. Plus some information on Russian cuisine. Do you know all national Russians holidays? 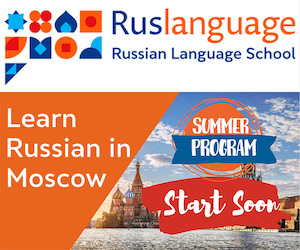 Find out on this page about Russian holidays. Learn how to say the days of the week in Russian—from Monday to Sunday, plus a few extras to help you talk about your schedule and calendar activities. Learn how to pronounce the months of the year in Russian. Find out the difference between the old-style and new-style calendars. Learn how to say the seasons of the year in Russian. This lesson includes pronunciation, examples, related adjectives, and notes on using the instrumental case with seasons.